You’re looking to save money and simplify. Good news: Solar doesn’t have to be complicated. Our partnership with you doesn’t end when your system gets installed. We’ll be here to monitor and manage your system to ensure it keeps working well into the future. Plus, we’ll empower you with tools to check your system’s energy production in real time, maximizing your profits and return on your investment. As a homeowner, you are constantly worrying about what your electricity bill is going to be from month to month. We get that, which is why our goal at NJ Solar Power is to bring a positive monthly cash flow from your system, and some serious savings too. We can help you reduce or eliminate your energy bills and receive supplementary income by installing a solar system tailored to your unique energy needs efficiently and sustainably. Why allow the leasing company to make all the money? Our zero down purchase option enables you to make money every month and maximize your profits. System Design: We offer homeowners a FREE assessment of their solar capability. We begin this process by analyzing your home and evaluating the system size requirements based on your annual electricity usage. We then create a completely customized system design based on your individual needs. 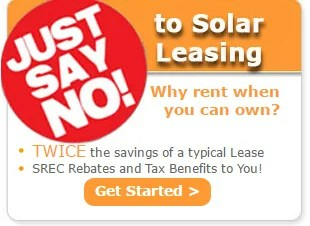 NJ Solar Power will work with you to provide the best options for financing your home solar system. We offer several low-interest financing options designed to maximize your profits. Options include a plan that often returns the entire cost of a system in as little as six years. Installation: NJ Solar Power has the state's best and most qualified engineers that will design and maintain your system to eliminate as much of your utility cost as your property will allow. We’ll work with you on a flexible schedule that results in minimal disruption to your normal routine. Monitoring: You want to be in-the-know about how your system is performing. That’s why all of our installations are equipped with remote monitoring capabilities, so you can see the savings the system is providing in real time.